Encreative is a modern and unique accordions framework that is built using the most famous bootstrap 4 web framework. Encreative display more and more contents on your websites in a well-organized and professional way. Encreative framework packed with 12 different color variant accordions, dual accordions, multiple accordions, image accordions and video accordions for use on various web purposes. Encreative accordions can easily integrate with any type of bootstrap 4 website, web app or dashboard. Not only that, Encreative is highly flexible and highly customizable framework that can be used with any purpose. Encreative accordion support for images and embedded videos like YouTube, Vimeo and Self-hosted, therefore it is easy to add multimedia elements to the accordions. Bootstrap 4 responsive fluid and grid system design allows to display accordions as general width accordions and as well as full width accordions. In addition you can add single and dual images, paragraphs, headings and more multimedia elements to the Encreative accordion containers. Compatible with latest bootstrap 4. User friendly design and suitable for any project. 100% ultra-responsive (Automatically adjust the size). Bootstrap 4 fluid and grid layout. It is very easy to integrate with any type of bootstrap 4 project. Image accordions for additional descriptions with images. Suitable for any type of background color or images. Solid colors + gradient colors. Self-hosted, YouTube and Vimeo embedded video support. Pure CSS animation hover effects. Pure CSS font awesome icon hover animation effect (Rotate). No external fonts (Comes with cross-browser support safe fonts). Suitable for any background (Under background colors or images). It easy to customize (Well-commented CSS codes together with help steps). Major browsers are support (Safari, Chrome, Firefox, Opera, and Internet Explorer). Customizable Options of Encreative Accordions. Accordion body font size - you can change font size of the accordion body . Icon and icon background size you can change. Panel heading size - you can adjust the panel height to your proffered size. You can create full-width accordions by adding a HTML class name. You can change the panel icon to your preferred icon. All above customizable options are available with Encreative accordions, and help guidelines provided together with codes (Well-commented codes). What Includes in the Encreative Package? 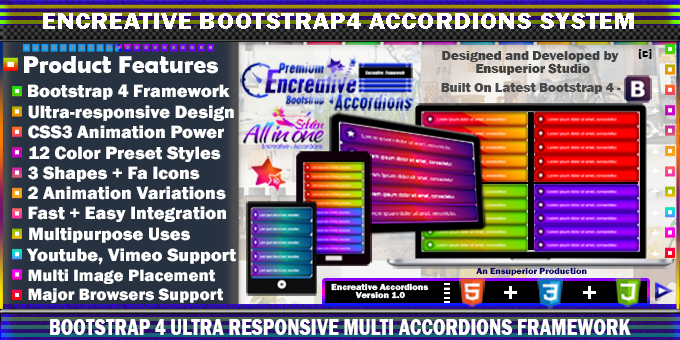 Encreative accordions framework (HTML files and Stylesheet). Following libraries are used to design the Encreative Accordion Framework. Images in the live preview are not included in the Encreative package. Only “place holder” images comes with the Encreative package.